The Dept. of Trade & Industry calls a 2nd Meeting with the Dept. of Agriculture on 8/26/10 in trying to set a Suggested Retail Price (SRP) for white refined sugar as a guide for retailers to sell to the market. Sugar Millers and Distributors were called on to elaborate their supply situation and all stakeholders were encouraged to tow the line in providing affordable sugar to consumers. PAGASA Corp. Sec. 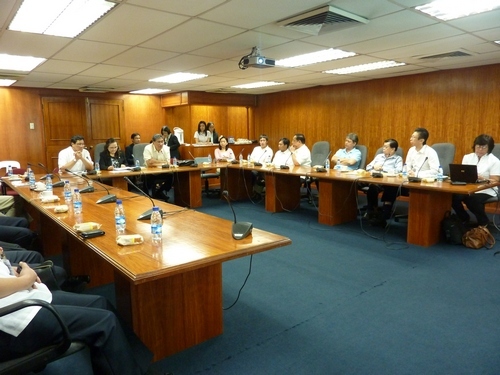 Roy Chua (2nd, right)attended both meetings as he listens intently to Bureau of Trade Regulation & Consumer Protection Dir. Jesus Dimagiba speaks his piece.